IWF 2018 will be held Aug. 22-25 in Atlanta, Georgia. IWF Atlanta promises to be a great show. This year’s event — held Aug. 22-25 in Atlanta, Georgia — has been sold out for months and more than 1,025 exhibitors, including 210 that will be there for the first time, will be showcasing thousands of products and services. And organizers are expecting more than 30,000 attendees. “It’s looking really good, and our registration is very strong and pacing ahead of 2016 by double digits,” said Jim Wulfekuhle, IWF vice president sales & marketing. If you’re in the industry and you want to improve your business production, design, creativity and distribution you need to be at IWF, Wulfekuhle said. 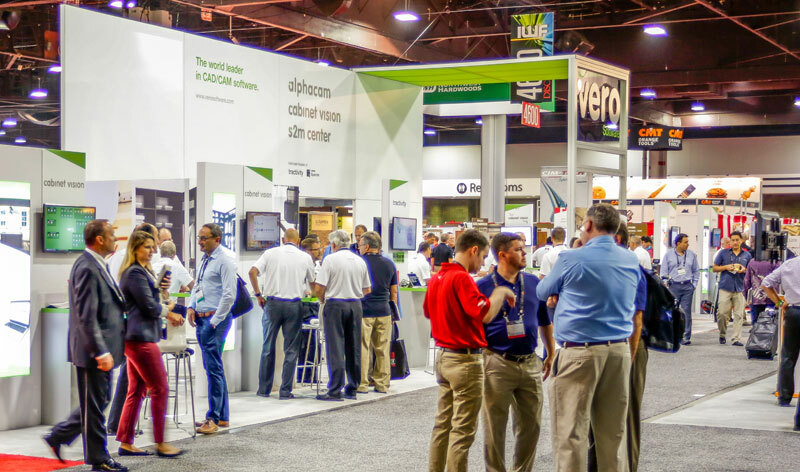 At IWF you’ll be able to see everything you need, from raw materials, supplies, and finishing accessories to woodworking and material processing machinery hardware. The show will also feature the newest products, trends, and solutions for wood, plastic and other related material processing industries. From the small shop to the large plant-industry, buyers know that the IWF is the place to source products — see all the suppliers and manufacturers specializing in everything from wood veneers to woodworking machinery, material processing tools, laminates, adhesives, decorative hardware, flooring and more — discover new ideas, network with peers, and learn from those who have already troubleshot the solutions. “We also offer networking and education and it all happens at one place at one time at the largest event for the industry in 2018,” Wulfekuhle said. He also reminded everyone not to miss the International Reception Aug. 23 at the Georgia World Congress Center. IWF is the top woodworking trade show in the world for the furniture manufacturing, architectural woodwork, custom and general woodworking industries this year. The last show marked the 3rd consecutive show that had growth in both exhibits and attendees with a total of 27,260 in attendance. And if you go, expect to find more than 500,000 sq. ft. of exhibition space chock full of machinery and supplies, products and services. IWF is the trade show where attendees come to source and buy new products and look for new ways to improve their business. There will be plenty of live demonstrations and seminars and education sessions offer opportunities to learn, solve manufacturing challenges, discover new and innovative ways of manufacturing and find out about the latest marketing strategies, all designed to improve your business.